Prodigious™, a division of Publicis, integrates ConceptShare OEM to create BrandTracker, part of the MarketForward product group. We'll be happy to show you how ConceptShare and Prodigious work together to streamline your marketing operations. BrandTracker is a web-based solution that simplifies the management of creative projects by allowing you to work with your agency partners online, from creating a brief and getting a quote, to tracking your work’s progress right up to delivery. Some of the biggest brands in the world, like Coca-Cola, Total, and Citroen, use BrandTracker to streamline creative operations and deliver approved assets on time. Store campaign files and documentation. Create briefs online for creative and production jobs. Follow a project approval workflow. Review and approve work online. Track projects and progress on one single screen. 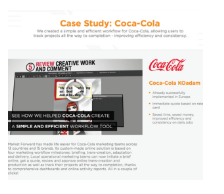 We created a simple and efficient workflow for Coca-Cola, allowing users to track projects all the way to completion - improving efficiency and consistency.